Here's the perfect birthday cake idea for a backyard party or camping party or for those outdoorsy types. 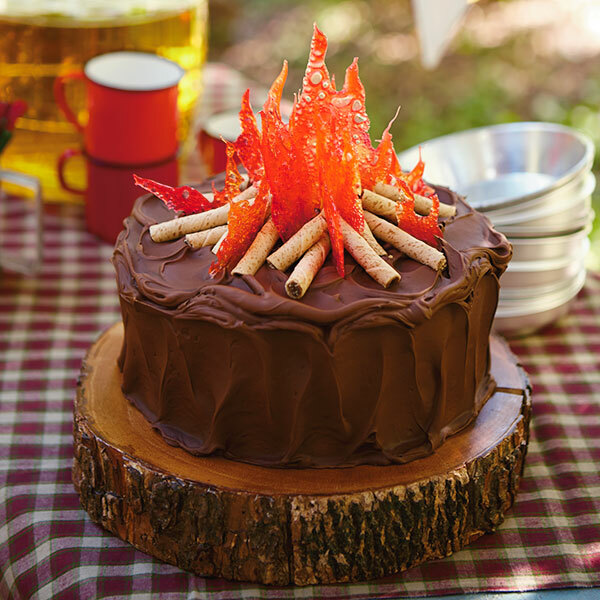 Our chocolate Campfire Cake is topped with crackly hard-candy flames and rolled-wafer cookie logs. This Campfire Cake recipe is sure to light up the birthday camper as well as the other party guests. Make your favorite cake using the 9-in. cake pans to make 2 layers. Bake layers according to your recipe and set aside to cool. Make your chocolate frosting and frost cake after it has cooled. Use the offset spatula to create loose swirls on the sides and top of the cake. Preheat oven to 375˚F. Unwrap butterscotch candies and put them into a sandwich bag. Press out all the air and seal bag closed. Crush candies with the meat tenderizer or rolling pin until they’re pea-sized or smaller. Repeat this process with a separate sandwich bag of cinnamon candies. Line a baking sheet with parchment paper. Add a spoonful or two from each bag of crushed candies to form a mound in the center of the parchment paper. Don’t over mix the colors. Form 2 more “mounds” of crushed candies to the left and right of the center mound, several inches away (to avoid them joining as they melt). Place baking sheet in oven and bake for about 5 to 7 minutes until candy liquefies. Keep an eye on the candy as it melts—you want it melted but not bubbling. When the candy has melted, remove the baking sheet from the oven and use a toothpick or the end of a skewer to “pull” out flame shapes from the centers of the liquid candy. Pull in a single direction. Avoid letting the candy get too thin at the tips of the flames or it may break when you try to remove it from the parchment paper. If candy starts to harden too quickly, put it back into the oven for another minute or two. Once you’ve created 3 “flames,” make another round of flames, varying the sizes of your mounds. Make about 6 to 9 flames total to give yourself plenty to work with when assembling. Let them cool on the counter top. Don’t put them in the refrigerator or they may droop later.